Oh, how I read these words with such delight! Yes! Someone else feels the same way as I do. They really get me. What a magnificent feeling that is for a newly passionate baker. I don’t know where I would be right now if it weren’t for my starter. I feed it everyday, it’s like a little refrigerated pet, and it soothes my spirit to know that it is booming with nutrients and will make a pretty awesome loaf of bread everyday, if I want it to! Any human being who writes words like that will grab my attention…Let’s just say, I am an instant fan. It feels like Shakespeare to me. Shakespeare for the Breadmaker. And now I cannot put his book down. Whom is this person, you ask? Well, it is no one other than Mr. Chad Robertson of Tartine bakery in San Francisco. Mmmmmm. If you haven’t been to this bakery and live within a hundred miles of the Bay Area, you are missing out. Get your tail on that BART and get some bread already! Don’t worry — if you are gluten free, they have some options for you that are super delicious too. And for those of you who don’t live closeby, his new book is a must-read for all of you out there who are uber passionate about fresh bread. His recipes are simple and thorough and his constant drive to create wholesome bread with just the four main ingredients is so refreshing and inspiring. The entire first chapter is devoted to his time in France when he was first starting out. Talk about taste nostalgia. It is a cookbook, but not in the formulaic sense. It feels more like a narrative and it helps teach you to dig into your intuition when it comes to making a better loaf of bread. Amazing, if you ask me! 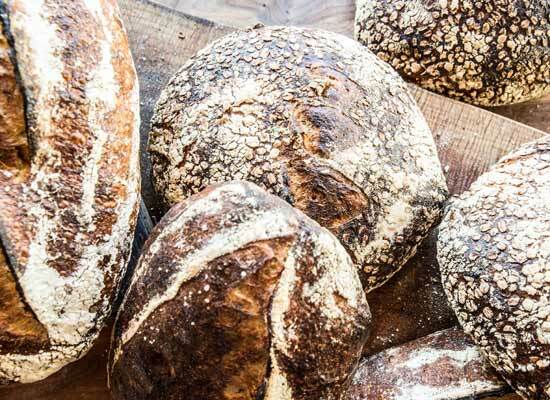 I took a class a few weeks back taught by a great guy named Michael O’Malley and he told us all about Chad Robertson and how his book, Tartine Bread, is the hot new book on bread. I cannot put the thing down! 1. If you want to be a real bread maker, invest in a scale. Cups aren’t gonna work anymore, folks. Grams are much more consistent. You have to start thinking more like a chemist, if you want to be a pro. 2. Feed that starter everyday, if you can. If you miss a day, don’t be hard on yourself. It will survive. But nurture it, because after all it is a living thing. 3. In the words of Andrew Whitley, “real bread takes time,” but it also makes time too. I used to say I never had the time to make my own bread, that I was too “busy.” In reality, making more bread has allotted for more things to get accomplished because I have become more patient and conscious of timing…that’s a beautiful thing. You can do it! Trust me, there is always enough time! Try it for yourself and report back if you think I am crazytown or there is some truth in it! 4. The hotter the oven, the crispier the bread. Seems like common sense, but wow! The MOMO oven is heated up to nearly 600 degrees, the bread is finished in under 20 minutes or so, and the crust is crispy and the inside moist. Yum! 5. Mixers are not necessary. Don’t be afraid to get in there and use your hands. Less clean up, less oxidation (nutrients don’t fall away) and at the end of the day, there’s more love in it too. 6. If the starter floats in water, it’s healthy. If it smells like acetone, trust yourself, it is acetone. Try to revamp it, don’t give up immediately, but if it continues to have a searing smell like your sister’s nail polish remover, throw that stuff away and start fresh. And the most important lesson in all of this, the Aesop’s Fable of sorts, well, at least for me is that it is of the upmost importance that you are doing what you love in life, folks. Regardless of time, and money, and stress, or whatever. Little did I know that having a sudden, crappy gluten allergy was going to lead me on a tailspin of happiness and self-discovery! I hope the same for you all, that you do what you love, no matter what it is that makes you smile!